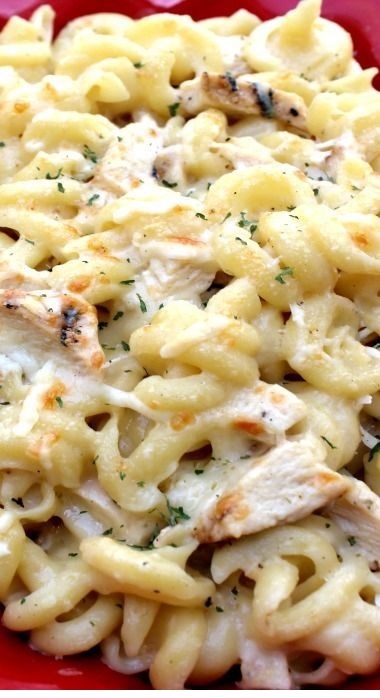 Rich and creamy pasta bake made with a four cheese sauce, chicken and noodles. Delicious dish, easy to prepare and even better to share. Heat oven to 350. Spray baking dish, square 9x9 or oval dish, with cooking spray. Cook pasta as directed and drain. Melt butter in a saucepan over medium heat. Stir in flour. Gradually stir in broth. Heat to boiling, stirring constantly; reduce heat to low. Stir in mascarpone, white cheddar cheese, Gouda, parmesan and half-and-half. Allow all cheese to melt and meld together while continuously stirring. Once completely mixed together and cheese is melted, stir in chicken. Add pasta to chicken mixture; toss gently to mix well. Spoon into baking dish. Sprinkle with cheese. Bake uncovered about 15-25 minutes or until hot in the center.